"Why Do We Call Mary the 'Mother of God'?" Since the Son born to Mary is a single Person (and that Person is God) with two natures, Mary can rightly be called the Mother of God. The Person she's the mother of is God. He's not, strictly and philosophically speaking, a human person, as we are. This doesn't mean that Mary existed before God (which is an impossibility). She is a human person with a human nature. She existed before Jesus' human nature was created. Here's another way to look at it. A woman can't be the mother merely of a nature. She can only be the mother of a person who possesses a nature. When a child is conceived, he is a person, not just a nature. The same is true of Jesus, or else He would be two persons in addition to having two natures. Since Mary is the Mother not of Jesus' human nature but of Jesus the God-Man, a divine Person, she is rightly called the Mother of God. 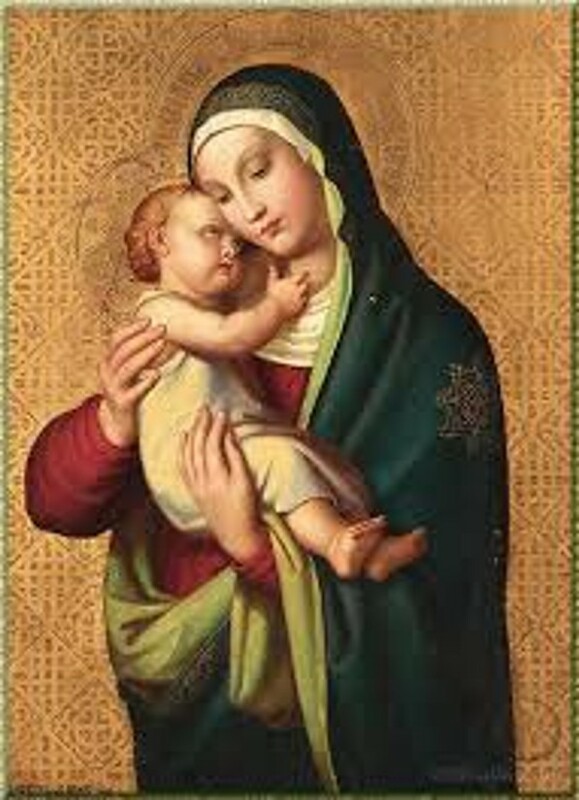 The title “Mother of God” is the Western Church’s equivalent of the ancient Eastern title “Theotokos,” which means “God-bearer.” In 431, the Council of Ephesus sanctioned the title Theotokos for Mary as a way of declaring and protecting the divinity of Christ. The title declares the most important truth about Mary: She is the Mother of God. When we celebrate this feast on January 1, we honor not only Mary but also Jesus, True God and True Man. We proclaim the glorious truth that in Mary’s womb the Second Person of the Trinity united Himself completely with our humanity. “Taking a body like our own, He surrendered His body to death in place of all. Through this union of the immortal Son of God with our human nature, all were clothed with incorruption” (St. Athanasius, On the Incarnation, 8,9). In Mary, we see the portrait of one who knew God’s shining face upon her, filling her with grace (Numbers 6:25). Looking upon her with love and showering her with divine blessings, God prepared her to say “yes” to His plan that she bear His Son into this world. As Mary consented in faith, the Father gave her His peace (6:26), continually encouraging her to trust Him as she saw His plan unfold. How deeply she must have needed this peace, as she faced dangerous and frightening circumstances such as giving birth in a faraway city in a cave, or fleeing to Egypt in the dead of night (Luke 2:4-7; Matthew 2:13-15). In each situation, Mary learned to trust more fully that God would bless her and keep her (Numbers 6:24). Because the Son of God took flesh in Mary’s womb, we too can share in these glorious blessings. We have been baptized into Christ; we have a share in His humanity. We are heirs of the blessings that God gave to Israel and in a particular way to Mary, the beloved Daughter of Zion. Like Mary, we can walk confidently in the blessing and peace of the Lord. The Son of God, who left His throne to become one like us, has conquered sin and death for all of us. Each day, we can freely receive the life of Jesus into our hearts simply by responding “yes” to the Lord’s call, just as Mary did. By Jesus’ sanctifying blood, we have been made vessels of the Holy Spirit, enabling us to cry out “Abba! Father!” as true sons and daughters of God (Galatians 4:6-7). The Lord is not far off, but very near; indeed He dwells within us through His Holy Spirit. Let us turn to Him and allow His blessing, grace, and mercy to shine upon us.